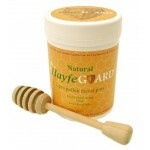 About Hayfeguard Hayfeguard are professional beekeepers since 1924, and have perfected a high strength honey, pollen and royal jelly formulation. They use our fresh local, unpasturised and coarse filtered honey, adding thousands of pollen grains & fresh royal jelly. This premium honey is a combination of honeys taken from hives located in several areas in the south of Britain and thus the honey is more likely to have traces of pollen from many different plants. Having a wide range of possible pollens is considered important to deriving health and therapeutic values from the honey. Key point: Hayfeguard is primarily sold as an aid to those who suffer from hayfever preferably taken 2 months before any expected symptoms.